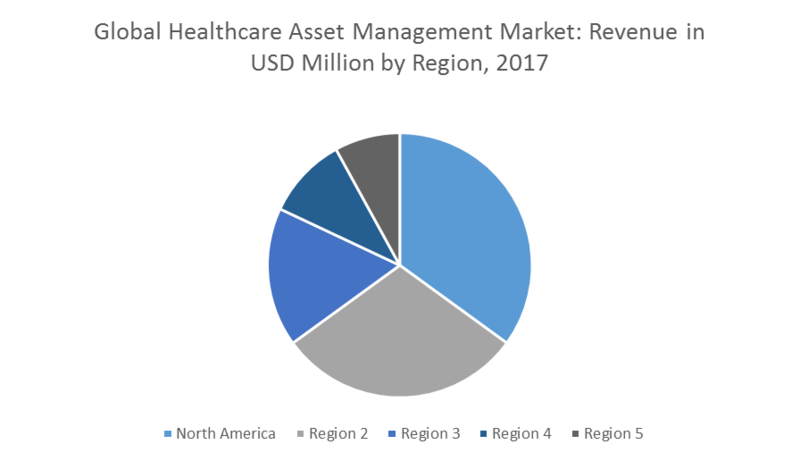 The global healthcare asset management market was estimated at USD 18.6 billion in 2017. The market is expected to register a CAGR of 7.54% during the forecast period (2018-2023). North America accounted for the largest market, while Europe came next. Asia-Pacific is estimated to register the highest CAGR growth over the forecast period (2018-2023). The WHO estimates that counterfeit medicines may constitute about 10% of the entire volume of drugs, globally, and the revenue generated from these counterfeit medicines could be close to USD 75 billion. This percentage share of counterfeit drugs proves the severity of the issue of counterfeiting in the drug industry; however, it fails to highlight the serious threats these drugs pose in some geographical regions, such as Asia-Pacific and Africa. Some studies suggest that counterfeit drugs’ market share could be even more than 30% in the developing countries of Africa, parts of Asia, and Latin America. A report from the United States Trade Representative (USTR) further clarifies the menace and estimates that 90% of all counterfeit pharmaceuticals seized at the United States border in the fiscal year 2016 were shipped from China, Hong Kong, India, and Singapore. Along with increasing incidents of drug counterfeiting, the need to maximize the efficiency and reliability of available resources in hospitals to make healthcare accessible to all and patient-centric and value-based trend in the healthcare industry are the major drivers for the market studied. The majority of large hospitals were built much before the real-time location systems (RTLS) or radio frequency identification systems (RFID) came into existence. Hospitals are often combination of buildings, built at different time periods and composed of different materials. Different materials in structure in the same hospital can present problems for accurately triangulating tags, in case of weak signal strength. Rooms shielded with lead pose challenge for RTLS systems, for operating within that specific location, as well as in contiguous hallways and rooms. In these cases, RTLS cannot be implemented. Due to these reasons, the availability of skilled professionals that may efficiently use molecular markers in the research is restricted. For example, RTLS cannot distinguish between the wheelchairs that take patients upon discharge and the wheelchairs that fall prey to theft. So, factors like old healthcare facilities are restraining the growth of the market, along with the other factors, such as the issues related to accuracy of these devices and data Integrity and safety[A1] . North America accounted for the largest market share, accounting for around 40% of the global market. In North America, the availability of robust health care infrastructure has propelled the demand for hospital asset management solutions. Along with the North America region, Europe is also leading the global hospital asset management market. Asia-Pacific is the fastest-growing region for healthcare asset management and portrays huge potential for growth in the future, due to increasing government initiatives, as well as corporate investment to standardize the biopharmaceutical and healthcare industries in the region. July 2017: GE Healthcare acquired the clinical outcome consulting firm, Novia Strategies. June 2017: GE Healthcare debuted its Wireless Asset Tracking Technology. Major Key Players: Aeroscout Inc., Awarepoint Corporation, Airista Flow, GE Healthcare, IBM Corporation, Infor Inc., Motorola Solutions, Radianse, Siemens Healthineers, and Sonitor Technologies, among others.